For every good reason that exists for following a rule, there's often an equally good reason for breaking it. The 3-patterns-per-room rule is a good one, particularly when you use colors that are the same intensity, balance them evenly throughout the room, and vary the scale (one large, one medium, and one small; or one large and two different mediums, for example). Mixing patterns can be a bit intimidating, and the 3-pattern rule can help to ensure it doesn't get too overwhelming or chaotic. When to Break It: When you have a large room or you just really love patterns. Large rooms can handle more, so go ahead and layer in as many as you see fit. And if you're simply a "more is more" type of person go ahead and add as many as you like. However, it will definitely look best if you use odd numbers, be it 5, 7 or 9. 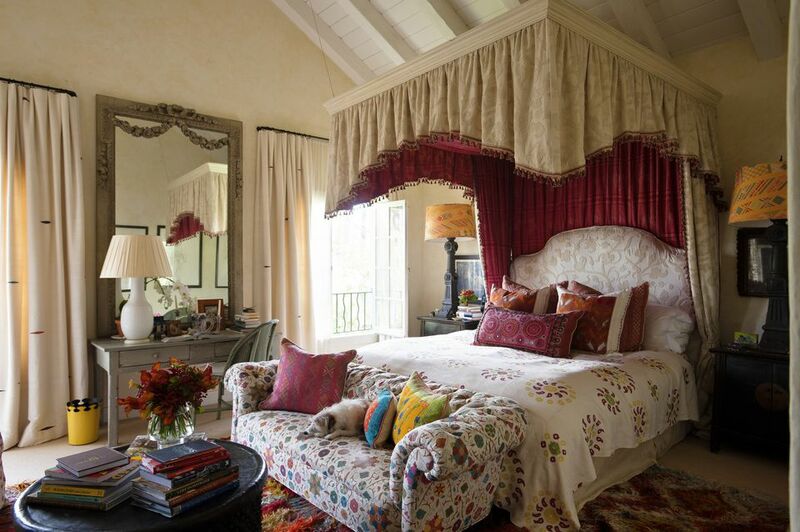 And try to limit the extra patterns to small areas such as throw pillows. It can be very challenging to have a patterned sofa on top of a patterned rug in front of a patterned wall and full of patterned pillows. Break it up with solids and try to group patterns with similar themes (be it color or style) together. And of course, always trust your eye. Sometimes things can come together in unexpected ways so if it looks good to you go for it! It's true. Light colors make a small room look bigger. Pastels, shades of white, and light neutrals are best for creating a feeling of openness and airiness, which is why they're often recommended for small spaces. As are light fabrics such as cotton and linen. When to Break It: When you want drama. Just because light colors make small rooms feel bigger it doesn't mean you have to use them. Who said a small room needs to try and look different than what it is? Instead, embrace the small proportions and decorate with abandon. Some small rooms are meant to be dark, dramatic and cozy. So if that's the look you're going for go ahead and use dark colors, rich fabrics, and bold patterns. Color is a powerful tool, and many people agree that every room needs a little color to give it life and personality. Whether it's a colorful piece of upholstery, a bright piece of art, or something bigger like colorfully painted walls, color can impact the mood of the room and have a big impact on the people in it. When to Break It: When you want to go all white. All white rooms are not uncommon, and while some people feel they are too boring and flat, the reality is that they can be full of depth. The key is to use different textures and materials and layer them together throughout the room. Add warmth with natural materials such as sisal, rattan, and wood, and also include some natural greenery. It's important to remember that while this look works with all-white and very light neutral rooms, don't attempt it with bolder colors. It becomes jarring to the eye and feels too intense. Should rooms have a single style? Some people think so. But most of those people are traditionalists (not that there's anything wrong with that). Rooms can be modern, traditional, french country, bohemian, shabby chic, rustic, transitional—the number of styles goes on forever, so if you're one of those people that thinks a room should be a single style, you certainly have plenty to choose from. When to Break It: When your style doesn't fit any particular mold. It is completely acceptable to borrow a little from one style, a little form another, and throw in a dash of yet another. In fact, very few people feel that their personal style can be easily defined. (If you ask most people these days what their style is they'll say "eclectic".) Chances are your home has little bits of a bunch of styles, and that is perfectly ok. After all, you can't be defined by one word, so why should your home? Area rugs are great for anchoring a space which is why they're considered important. They also add warmth, comfort and color, which is why they're great decorative tools. As a general rule, it's a good idea to have a rug in all living spaces. When to Break It: When you want to open up a room. Removing rugs can make a space feel more open and airy, which can really help in small, open concept homes. Also, some wood and stone floors are incredibly beautiful and it's a shame to cover them up. Another reason is if you live in a hot, humid climate. Sometimes rugs can feel weighed down in these areas and removing the rug can make a room feel lighter. And of course, no rug makes sweeping up a lot easier! Even though decorating rules can be very helpful, there are often reasons to break them. The key to good design is being smart enough to follow some of the rules while being fearless enough to break others. As with anything in design, it's important to always trust your instincts, trust your eye, and always decorate with things you love.